If you are a big fan of History, then Ainsworth Gaming's title released in August 2014 will give you some sweet memories. Trojan Treasures video slot tells the legend of the Trojan horse that enabled the Greeks to enter Troy city. Ainsworth developers have been on the frontline of creating exciting and brilliant online video slots since they joined the industry in 2013. The company is owned by the best-known software developer, Len Ainsworth. Trojan Treasures slot is not only visually appealing with stunning graphics and animations, but too, comes with exciting symbols and unique features to increase your chances of winning. The slot layout is simple; you will play with five reels, three rows and 30 pay lines which reward from the leftmost to the rightmost. Trojan Treasures slot accommodates players with both low and high stakes as you can play from $0.02 per line up to a maximum of $100. With a medium variance and a theoretical return to player of 94.16%, you expect the slot to be dynamic and with decent payouts. Relive the rich Greek history with Trojan Treasures slot from the smartphone, tablet or desktop instantly. Discover the rules of playing, how the symbols reward, and more by reading our detailed review. 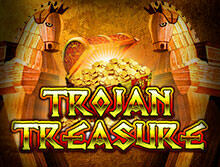 Visually, Ainsworth Gaming developers have done a great job in Trojan Treasures slot. The symbols and other icons are made to match the theme of the game. The background of the game shows the ruins of a once magnificent town and several warriors regrouping outside an ancient castle. The reels are semi-transparent to allow you to view the backdrop, surrounding golden lighting to imply the presence of hidden treasures. You will see the wooden Trojan Horse appear on the right side of the screen to reward you with countless coins. This is a modern video slot comes with simple and easy to use settings. An epic battle little this deserved to be honoured with its very own video slot, and Ainsworth has definitely succeeded. Trojan Treasures video slot does not only come with an attractive interface but also simple rules that are easy for beginners to follow. As you may be aware, the slot is played with 5 reels on 3 rows and 30 fixed paylines. The betting menu is not complicated with many options. You will be presented with the option to set your bet per spin, per line which is between $0.02 and $100 and the number of lines and $.003 up to $300 for the max bet. All these can be increased or decreased using the (+/-) signs located adjacent to the spin button. Click on the Spin button to set the reels in motions and use the (+) to play up to 100 Auto Spins. You can monitor your Cash balance, number of Lines and the Total Bet from the bottom of the screen. 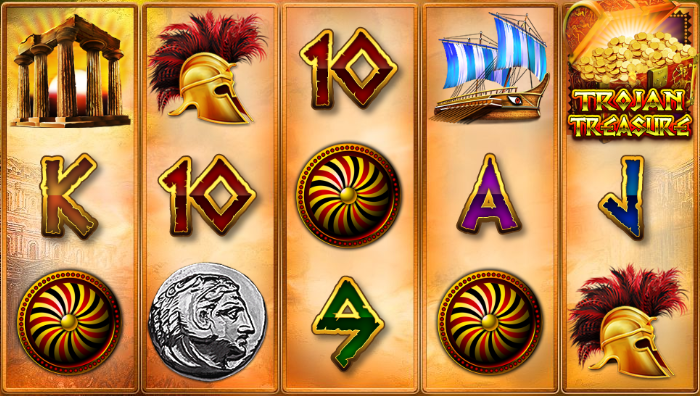 The symbols used in this video slot are what you expect from an ancient Greek movie such as the warrior helmets, castle, ships, shields and the Trojan horse. The reels are also occupied by traditional card symbols represented by K, Q, A, J, 9 and 10. The themed icons offer the highest payout based on the paytable while the regular letters have low payouts. The Trojan Horse is the wild symbol in the game, and it will replace for all other symbols on the reels to increase your chances of winning except the scatter symbol The wild symbols will only show up on reels 3, 4, and 5 during the base game and it powers are limitless. The Scatter symbol is represented by the Treasure Box on the screen. Land three or more of the scatter symbols anywhere for a chance to receive an additional reward of up to 3000 times your bet amount. The 8 Free Games in Trojan Treasures slot are triggered when you land three or more of the scatter symbols anywhere on the reels. The Horse wild symbol will only appear on reels 3 and 5 to substitute for all other symbols except the scatters and the Multiplier Horse symbol during the Free Games feature. Nothing beats the fun and thrill of playing Trojan Treasures slot on the go. The slot is designed with the latest HTML5 technology which enables it to fit on devices with small screens like smartphones and tablets powered by iOS and Android. You will enjoy smooth gameplay, high-quality graphics and animations and great sound effects, just like when playing from your desktop or laptop. Since Trojan Treasures is an instant play video slot, you will not be required to download any software or app. The game is playable directly from any mobile browser like Chrome, Opera, Safari and Firefox. Ainsworth may be a new name in the online casino market but not in the gambling world. Besides being owned by the most reputable software developers, Mr Ainsworth, the company started developing slot machine games way back in 1995 for brick and mortar casinos in the UK. Its activities and products must adhere to the laws of the UK Gambling Commission and Alderney licencing companies. The developer is working in partnership with giant developing companies like Playtech and Microgaming who have vast networking in the industry. Today, you will find popular titles like Twice the Money, Money Money, Ming Warrior and many others available in free play and real money. bCasino is the best UK based online casino offering Ainsworth's Trojan Treasures video slot among other titles. Our website was launched at the beginning of 2018 by GS Technology Limited company to provide players with top-notch slots and other game variations. When you sign up at our casino, you will receive a generous reward of up to $1200 welcome bonus plus 100 free spins! We also have daily promotions to ensure that our customers dont miss out anything. You will be lost for choice when you visit our game library. We have games from blackjack, roulette, baccarat, craps, video poker and slots from multiple providers like NetNEt, Playtech, Thunderkick, Yggdrasil, Betsoft and others. You will choose from different payment options including eWallets, debit and credit cards and mobile payments to deposit and withdraw you wins at any time. We can not forget to mention our unmatched customer support team who work around the clock to provide you with all solutions. You can contact them via email or live chat 24/7.